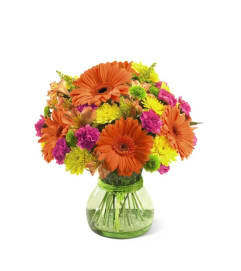 The FTD® Vibrant Views™ Bouquet blooms with a bright energy to offer your warmest fall greetings and sentiments to friends and family near and far. 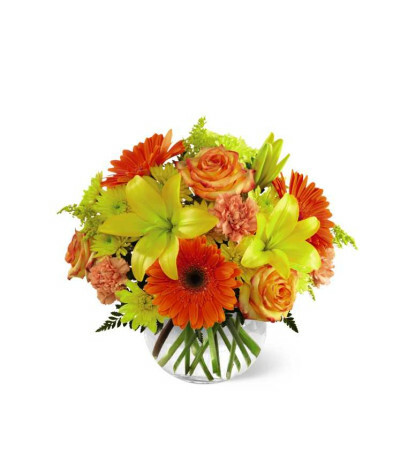 Stunning yellow Asiatic lilies, chrysanthemums and solidago are brought together with orange roses, gerbera daisies and carnations, all beautifully accented with lush greens, to create an unforgettable fresh flower arrangement. 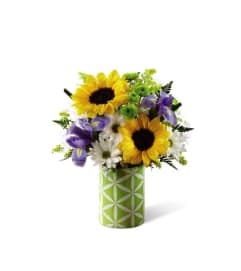 Presented in a clear glass bubble bowl vase, this mixed flower bouquet can also be used as a centerpiece for a fall gathering, making this an excellent Thanksgiving, birthday or thank you gift.